There are issues now with falling numbers in both the leisure and racing sectors of Cycling Ireland’s membership. 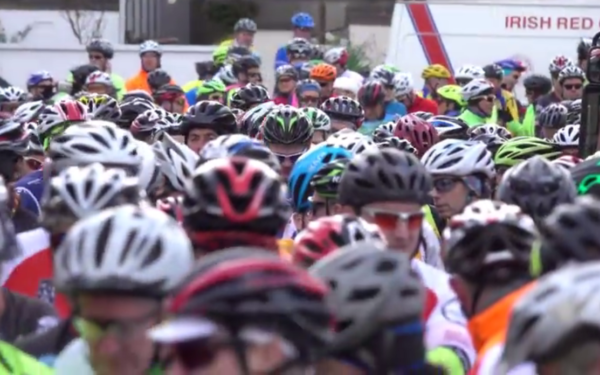 There has been a significant decline in Cycling Ireland membership this year, with numbers dropping by 10 per cent. 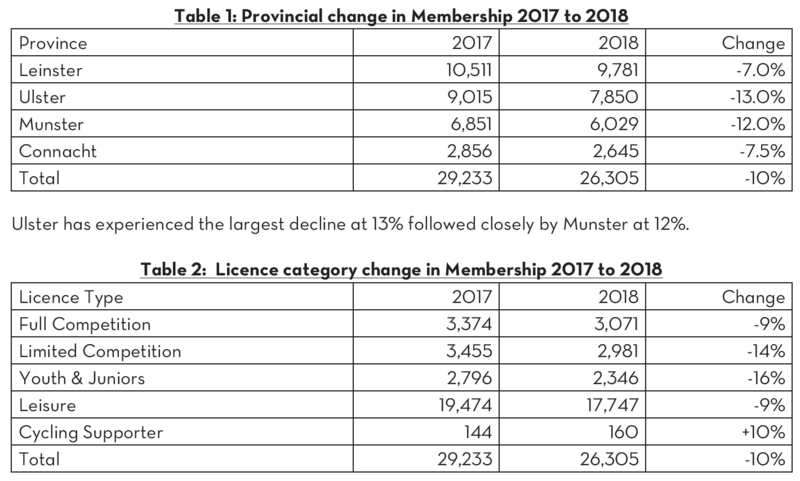 Overall numbers have fallen from 29,233 in 2017 to 26,305 at present – a drop of 2,928 members in 2018. Furthermore, the decline is the first time since the cycling boom began that numbers have fallen back. While the overall reduction is a concern, most worrying is the fact that leisure cycling membership has fallen sharply. 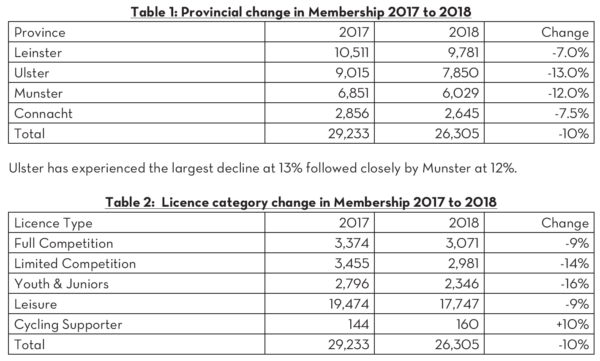 That decline – from a peak of 19,474 last year to 17,747 this year – is the main driver of the overall reduction in Cycling Ireland memberships. And in the racing ranks, the number of youth licences issued this year declined by 16 per cent. That drop off will worry those involved in the racing scene as youth riders, including juniors, are seen as its lifeblood. This year is also the second year in which the number of youth racing licences issued has fallen. 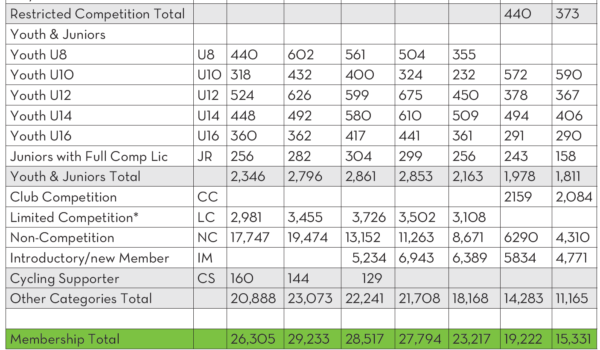 The membership numbers have emerged in material prepared for the Cycling Ireland annual general meeting this weekend. Stickybottle readers can view a number of graphics below which show where most of the membership is based. 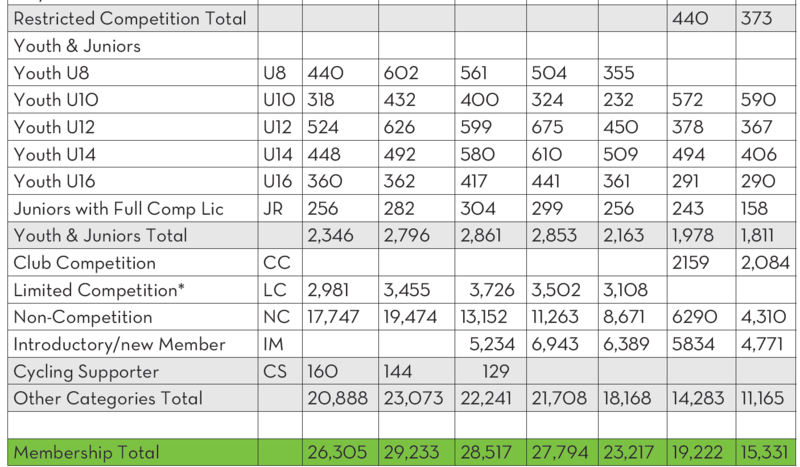 The tables also show what disciplines of cycling generate most memberships, as well as where the declines are most notable. Cycling Ireland’s outgoing chief executive Geoff Liffey said despite the “significant decrease in membership numbers” it had been a “solid” year. In his report to be presented at the AGM, he suggested some areas that might be addressed with a view to making Cycling Ireland membership more attractive to cyclists. “The exact cause of this decline is not fully known,” he said of the overall fall in numbers. While numbers were down, they were still high and there was a very strong network of clubs throughout the country. “I would see the need to overhaul the club affiliation process and bolster it with a strongly incentivised Clubmark scheme,” Liffey said. “This is partly underway in the Ulster region. The incentives need to become more attractive and meaningful to all club members. “How about tiering the events calendar so that the accredited clubs get guaranteed access to events for their members? “The existing club network has become somewhat too informal with easy ‘pop-up’ clubs and short-term racing teams appearing without any sustainable structure to maintain them. He added that clubs needed to critically look at what they offered youth cyclists with a view to holding on to them long term. “There needs to be stronger incentives and rewards for clubs embracing the youth sector, as many clubs are unwilling to embrace this area.